The OMG-COMM2-EX is a PC bus plug-in card based on the 16550 FIFO buffered UART, which is compatible with the standard 8250. 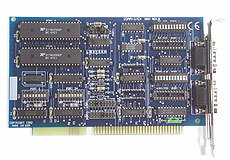 This dual channel asynchronous serial communication card utilizes balanced differential drivers and receivers to provide RS422 and RS485 communication. Selectable and sharable extended “AT” interrupts for each port increase the OMG-COMM2-EX versatility. Distances of 5000 ft. in noisy industrial environments are easily accommodated. The OMG-COMM2-EX is also capable of RS232 for applications requiring shorter distances and RS232 compatibility. Signals are transmitted and received via two 9-pin sub-D connectors. Bit character lengths of 5, 6, 7 or 8, and odd, even or no parity are all available. WIN XP/Vista/7 drivers are included as well as support for Linux. The drivers provide IRQ sharing, advanced UART support and serial diagnostic utilities. Current: +5 V @ 195 mA, ±12 V @ 25 mA ea.